Hate is no laughing matter, unless it's a meme of course! Dealing with haters isn't any fun when it's a serious matter, but looking at a few funny hater memes is a great way to use your sense of humor to replace that negativity. Hater memes are especially popular among people who are raving fans of one thing or serious rivals of another. For example, if you're a loyal fav of a particular sports team, you might hate a totally different sports team. Likewise, if you've always been an Apple fanboy, you might really hate anything that has to do with Android. 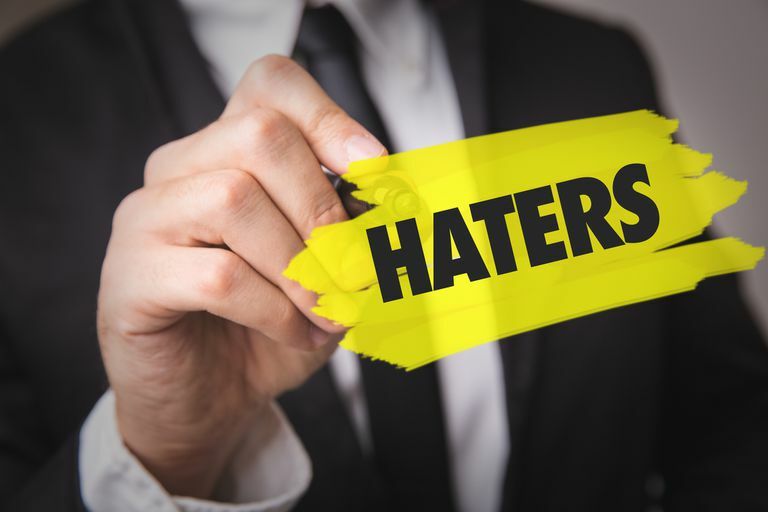 Sometimes haters can get personal and attack other people for their specific traits, actions or behaviors, but it's important to keep in mind that haters don't really hate other people at all. Their negativity is merely a reflection of how they feel about themselves and their own lives. How Are Hater Memes Being Used in 2019? Most hater memes are friendlier and funnier than you think. They typically poke harmless fun at people who are on the other side of the spectrum in the form of images, GIFs, quotes or tweets. So next time you find yourself dealing with a hater or several haters, turn toward these memes to help lighten up the situation and remind yourself that even though people have their differences and opinions, we're all still human. You didn't have to watch Bird Box to know this meme image well. Because if you block out the haters by blindfolding yourself, they can't really get to you, right? Renowned personal organizer, author and star of "The Life-Changing Magic of Tidying Up" on Netflix Marie Kondo might not be a true hater, but she definitely knows what doesn't spark joy—and she isn't afraid to tell people about it! Another Toy Story Movie? Haters Gonna Hate! Toy Story 4 is out in theaters this coming June of 2019, and viewers of the teaser trailer have a lot of questions about some of the characters. You'd think that Disney might stop after two sub-par sequels, but they clearly haven't. And that's a big reason why there are so many haters. No NFL fan seems to feel simply neutral about the Dallas Cowboys. They're one of the most hated teams in the league, which explains all the Cowboys hater memes that tend to pop up on both sides—from the fans who love to gloat when they win, to the haters who love to pick on them when they lose! Speaking of the most hated teams in the NFL, you can't deny that the New England Patriots' longstanding reign has left a lot of other teams' fans pretty angry and frustrated. Now having achieved another Super Bowl win in 2019, it shouldn't come as a surprise that the haters are strong amongst this team. HBO's Game of Thrones is a huge hit with a serious fanbase, but not all fans remain. Many have stopped tuning in over the years for a variety of reasons, from deciding that the shock value has been exhausted, to simply not wanting to keep up with as many characters or pointless plot lines anymore. There are lots of takes on the very popular "haters gonna hate" quote, but this Science Cat meme is probably one of the best. Since when is "potate" or "manganate" even a word?! The original 2005 rap song "Ridin'" from rapper Chamillionaire is every hater's theme song. In this particular meme, the word "sashimi" takes the place of the lyrics, "they see me." One big trend with hater memes involves covering your eyes so you "can't see the haters." There's just something about this middle-aged man using a couple of twenty dollar bills pushed through his glasses, the ridiculous background and dated text message that makes this hater meme so funny. Following the trend of "can't see the haters" is this very adorable little guinea pig. He's got a special pair of love glasses that appear to filter out all the haters and their negativity. You can dance and skip through the rain to show the haters how great your life is—even when the weather isn't. Just look at that perfect form! Patriots' quarterback Tom Brady has a lot of haters, but he might not be aware of how young some of them really are. It's actually a bit hard to believe that an adorable, smiling kid like this could be filled with so much hate! It's not exactly clear why it was such a big school picture trend to superimpose one photo over another back in the day, but we sure are glad that it was. 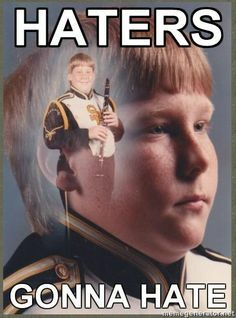 This kid's clarinet playing and marching skills were probably no match for his haters. We all have to deal with our inner hater. Whether that means silencing that self-criticizing voice or trying to change toxic beliefs about yourself, it usually helps by taking a good, long look in the mirror first. Comedian Dave Chappelle's "Playa Hater's Ball" is one of his most memorable and loved scenes that aired on his comedy show (The Dave Chappelle Show). It's one of the most ridiculous comedy sketches you might ever see, featuring an amusing take on the true art of what it takes to be a hater.